Explore the galaxy...in 20 minutes or less! In the 22nd century, colony ships were programmed to search for earthlike planets along trajectories calculated to visit stars with the best likelihood of habitable worlds. One such ship with its crew and passengers in cryostasis traveled over 2300 light years before a suitable planet was found. Hope is a temperate world located in the Glory system on the edge of a vast nebula often referred to as the Purple Void. The nebula is unique in that it contains many unusual star types and other peculiar phenomena. Over 100 years have passed since the colonists first arrived. It is a new beginning of deep space exploration. Technology has improved and mankind is no longer dependent on slow cryoships and robot probes. This is the setting of Strange Adventures In Infinite Space. The zip contains both Mac9 and MacX versions. -Generally comparable with Civilization I & II. -Artificial Intelligence (AI) computer-controlled players. -Internet & LAN multiplayer (TCP/IP). -Support for a great number of platforms see Requirements. 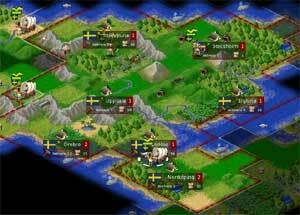 -more than 50 playable units and far beyond 100 nations. -Internationalization (i18n): Translations for 29 languages available. A magical lightning strikeBuild up a great army, gradually turning raw recruits into hardened veterans. In later games, recall your toughest warriors and form a deadly host against whom none can stand! Choose units from a large pool of specialists, and hand-pick a force with the right strengths to fight well on different terrains against all manner of opposition. Wesnoth has many different sagas waiting to be played out. Fight to regain the throne of Wesnoth, of which you are the legitimate heir... step into the boots of a young officer sent to guard a not-so-sleepy frontier outpost... vanquish a horde of undead warriors unleashed by a foul necromancer, who also happens to have taken your brother hostage... guide a band of elvish survivors in an epic quest to find a new home. 200+ unit types. 16 races. 6 major factions. Hundreds of years of history. The world of Wesnoth is absolutely huge and limited only by your creativity - make your own custom units, compose your own maps, and write your own scenarios or even full-blown campaigns. You can also challenge up to 8 friends - or strangers - and fight in epic multi-player fantasy battles. Mahjongg (also known as Shanghai, or Taipei) is a solitaire tile removal game. Ivory is a freeware electronic version of it. Available for windows(java), linux and macintosh.